This ultimate Everest Three High Passes Trek is for those who seek for more wild and challenging holidays experience as it is more demanding and the longer route crossing through three high passes that are not on the regular Everest trail. These are the Kongma La (5,535m), Cho La (5,420m) and the Renjo La (5,417m). You will also climb three hikng peaks; Gokyo Ri (5,360m) and Kala Pattar (5,54m) offer superb views of Everest, whilst Chukkung Ri (5,550m) is a lesser-known summit, tucked under the imposing Lhotse-Nuptse wall. This westerly approach to Everest provides amazing vistas of the world´s highest mountain and should be considered in particular, by the keen photographer or by those who want a tougher trek. 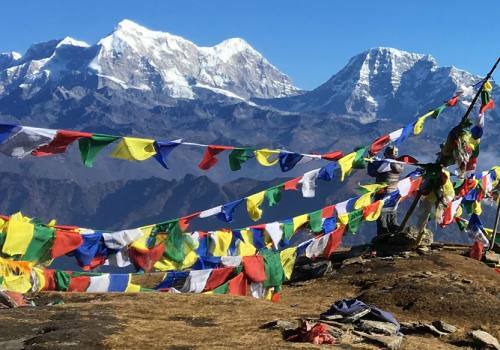 Our adventurous Everest Three High Passes Trek starts with an exciting mountain flight to the Tenzing Hillary Airport at Lukla – a beautiful mountain town. We begin our hiking from here to Phakding on the first day and second day we trek to Namche Bazaar, the Sherpa capital. We have a rest and acclimation day at Namche as it is vital to get acclimatized ourselves to adapt with high altitude. On the rest day we have option to hike to Khunde and Khumjung – a charming twin Sherpa Villages nestled bellow the Khumbila Rock and visit Everest View Hotel - the Five Star Hotel in the world´s highest place offering stunning views of Mt. Everest, Lhotse, Amadablam, Thamserku, Khangtega, Taboche Peak etc. Our rest and exploration day at Namche is followed by the regular Everest Base Camp Trek route walking through the places of Tengboche; where we will visit region´s most active monastery, enjoy colorful landscapes, other Buddhist monasteries, prayers walls, manis and Dingboche in the land enclosed by the soaring peaks. At Dingboche, trail breaks off with main trail and we head up to Chhukung – a beautiful hamlet of Sherpa Village, we will climb Chhuking Ri on the acclimation day at Chhukung and overnight in Chhukung, also it is always recommended that "hike higher and sleep lower" helps you acclimatized. Then our first three passes, the Kongma La, is probably the toughest day, but your reward is stunning views of Makalu (8,485, the world´s fifth highest mountain) to the east. It is a leisurely descent to Labuche, where we rejoin classic Everest Base Camp Route, before climbing the famous view point of Kala Patthar, second of our three peaks. Our trek to the view point of Kala Pathar is followed by the tough climb through Cho La pass that takes us to the cobalt-blue lakes at Gokyo. Here we trek our third peak; Gokyo Ri (5,360m). 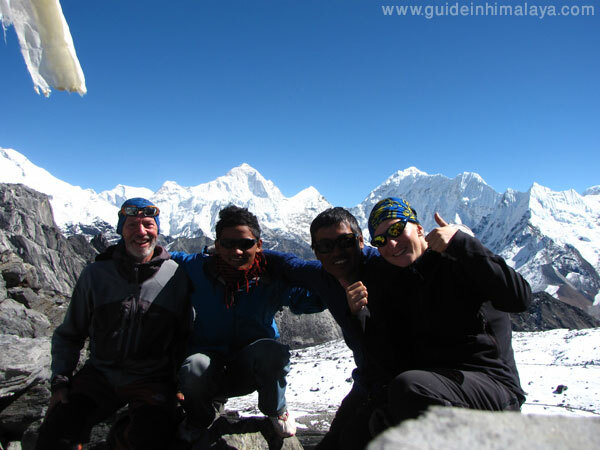 This is a lovely peak above the Gokyo Valley, with fabulous views of the Mt. 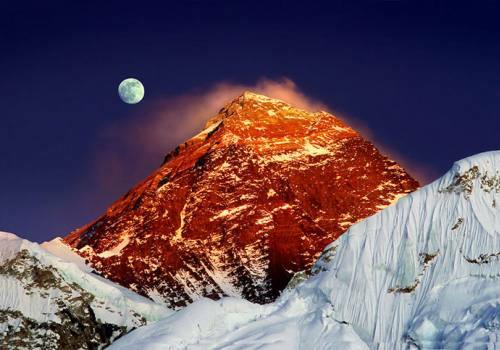 Everest, Cho Oyu, Makalu, Ama Dablam, Nuptse, Cholatse and many smaller snow-capped mountains. After enjoying awe inspiring views from Gokyo Ri and exploring Gokyo lakes, we make our way to the next great pass, the Renjo La. Making a night in Lungde or Marlung we follow a little of the route used for centuries by the Tibetan Traders via Nangpa La to get to Thame. Following the classical route, we drop down to Lukla and fly back to Kathmandu leaving behind our foot prints in the shadow of the Everest. If you are a real adventurer seeking for more of a challenging trek crossing some of the most famous high passes in the world, you really need to consider Wilderness Excursion´s Everest High Passes Trek. If you are looking a slightly less adventurous than this involves suburb views of Gokyo Lakes along with Everest Base Camp and Kala Patthar, "Everest Base Camp Trek via Gokyo Lakes - 17 Days" would be ideal for us! Wilderness Excursion´s "Everest Base Camp - 16 Days" itinerary would be perfect for you if you are young, energetic, physically fit, and yearn to hike up to Everest Base Camp and Kala Patthar but will have a limited amount of time to trek. If you are a novice trekker and want some easier itinerary but want to visit the Everest Base Camp, Wilderness Excursion recommend for Everest Base Camp 17 days itinerary would be best option. There are flights to Salleri or arly in the morning, we start to drive from Kathmandu to Salleri in a local Jeep, it is about 10 hours drive. We can book flights for comfortable keen travelers. If taking local jeep; we can view the panoramas of Riverside, jungle, wonderful landscape and the scattered villages during the ride. We cross the bridge at Sunkoshi River and continue through Okhaldhunga. On the way, we can see the incredible peaks as Dudhkunda (Numpur Himal), Everest and others.Then it is a continual drive up and up, which takes us to the district of Solukhumbu-Salleri. Overnight at Lodge. Day 02:Trek to Takshindo. 5-6 hours walk. This day; we hike to Takshindo, we begin our foothill journey after the hot breakfasts. It goes passing through the countryside road, which is wide and after our entire hike today is easy and comfortable. The view of Numpur Himal is awesome and the local scenarios accompany it. The trekkers, who fly to Phaplu from Kathmandu for 25 minutes, have also the same route for trekking. We cross small streams and hill gorges. From Fera, we walk through the jungle of Pine till we get to Ringmo. We walk furthermore 2 hours to reach Taksindo. We enjoy the first day trek and take a rest. Overnight at Lodge. Day 03:Trek to Kharikhola (2010m). 6-7 hours walk. From the hill of Takshindo, the picturesque scenarios of Salleri can be explored. 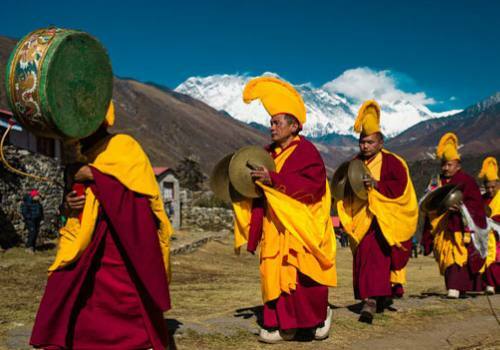 The monasteries of the village represent mystical touch with Tibetan Buddhism. From another ridge, the views of Lukla, Nunthala valley astound us. Then we descend through the pine and oak forest, pass the Nunthala village and continue trek down, cross the Dudhkoshi River and get up to Jubing. After about 2 hours ascend, we reach to Kharikhola. It will take about Overnight at Lodge. Day 04:Trek to Puiyan (2730m), 5-6 hours walk. We have a pass or two, dense forest and majorly an uphill trek in this section of the trail. 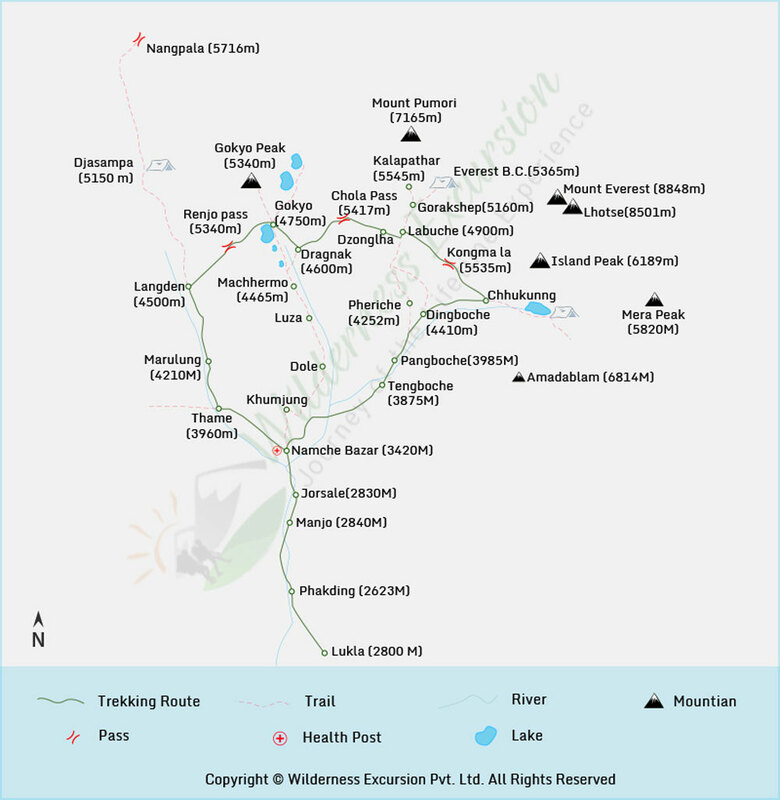 Initially the trek passes through the settlement of Bupsa, after the view of Khumbila mountain and explores the forest mostly dominated by monkeys before we reach to Kharte. Further on the trail we have uphill climb to the Khari La Pass (3145m). We have views of Gyanchung Kang and Khubila mountain from this pass. We shall carefully descend on rather slippery trail on the way to Puiyan after crossing a small stream. We may further ascend through the ups and downs and cross another Chutok La Pass (2945m), traverse through the Dudh Koshi canyon and end this section of the trek at Surke. Day 05:Trek to Phakding (2652m) 6-7 hours walk. Puiyan or Surke to Phakding The trek past this section of our trail shall be mostly of alpine vegetation though we shall have ups and downs in the trail. We continue besides the river through forests as we pass the route leading to Lukla airport and continue on to reach to the settlement of Chheplung where we meet the main trail to Everest that comes down from Lukla. We have more trekkers from this point onwards as we move along the trail with the view of snow-clad mountains, gompas and prayer wheels and interaction with the trekkers and locals we meet on the way. After the settlement of Dukhdinma, we continue straight on to the stoppage place of Phakding. Overnight in Phakding. Day 06:Phakding - Namche Bazaar (3440m) 6 Hours walk. After hot breakfast; we start our trek to Namche viaToktok, Benkar, Monjo and Jorsalle. After 3 hours hike passing many suspension bridges with good view of Mt. Thamserku and we should entry our Sagarmatha National Park entry permit and will have lunch in Jorsalle. Then we start to climb steep up slowly passing high suspension bridge till Namche Bazaar which takes about 2 and half hour. Stay overnight in lodge. Day 07:Acclimatization day at Namche Bazaar. As it is very important for the trekkers to schedule an ‘acclimatization day’ to acclimatize our body and to avoid AMS further up the trail. This never means we have to stop walking but it is always recommended to hike to higher elevation and sleep at lower so we can hike up to Everest view hotel for panoramic and spectacular view of mountains, walk to twin Sherpa village (Khumjung and Khunde) and vist Sherpa museum or hang around at Namche Bazar. 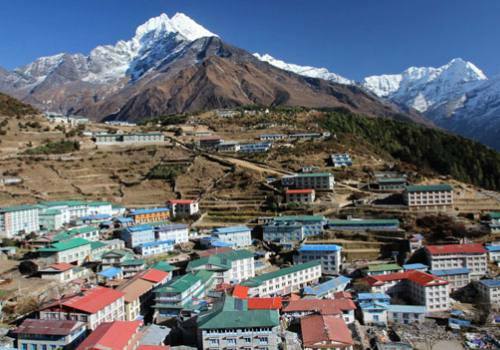 There are many hotels, lodges, restaurants, bars, cyber café, boutiques, souvenir shops and groceries at Namche. This place is nice to hang around. Stay over in lodge. Day 08: Namche - Tengboche (3870m) 5-6 Hours walk. Trek continues to straight until reaching Kyanjuma and it takes about 1 & half hour walk and then the trail climbs down to the Dudh Kosi River and cross by suspension bridge. We can see a series of picturesque water driven prayer wheel. Then we will have lunch in Phungi Thengna. The steep ascent brings us to Tengboche village. Explore the region’s most active Buddhist monastery which is region’s most active monastery. 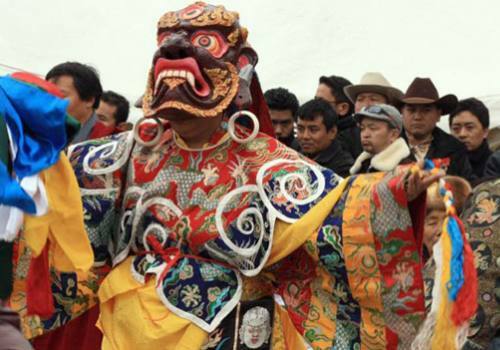 The monks open Gompa at 4pm for the visitors and we can also visit sacred land exhibition center. The views of the mountains are fabulous in the morning and evening. Stay overnight in Lodge. Day 09:Tengboche - Dingboche (4410m) 5-6 Hours walk. Day 10: Dingboche – Chhukung (4730m) 2-3 Hours walk. After breakfast we set up for Chhukung. It is a short day today so we can trek leisurely. We can have stunning sun set view over Mt. Lhotse and Kwangde in south from Chhukung. And stay overnight in lodge. Day 11:Chhukung– Kongma La Pass (5535m) - Lobuche (4930m) 7-8 Hours walk. To cross Kongma La in a single day, we start early morning. Carry plenty of water and snacks. There is no tea house facility between Chhukung and Labuche. You have an amazing view from top of the pass. Walk down to Labuche and stay overnight in lodge. After breakfast hot breakfast in the morning, we continue our trek in the left bank of Khumbu glacier and steep climb up till Changri glacier, and then short descend to reach Gorak shep. It takes about 2 and half hour. We take lunch break there, book room and dropped stuffs then hike to Everest Base Camp. Stay overnight in lodge. Day 13:Hike up to Kalapathr (5545m) and trek to Dzonglha (4830m); 5-6hours walk. 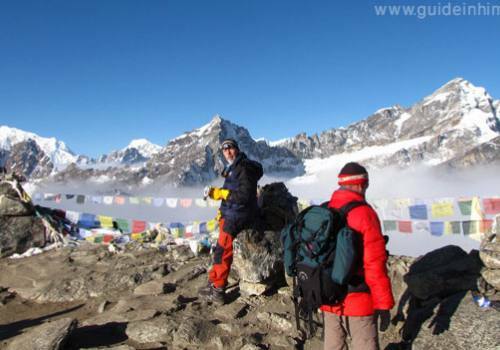 Early in the morning, hike up to Kala Pathar/5545m; meaning black stone. It is 400m ascends to Kala Pathar view point from hotel, takes max. 2 hours. Now the view is 360˙degreet view of Mt. Everest, Nuptse, Lhotse, Khumbutse, Pumori, Lingtren, Amadablam, Thamserku, Lobuche peak and other peaks all around. There is also unobstructed view of sunrise and sunset. Then we walk down to hotel after breakfast continues our trek to Dzongla via Lobuche. It takes about 4 hours to Dzonglha from Gorakshep. Stay overnight in lodge. Day 14:Dzonglha – Chola (5420m) – Thakna (4700m) 7-8 Hours walk. We should take a heavy breakfast because there is not any tea shop between Dzonglha and Thakna. We have to carry some snacks, dry food, cookies and enough water. It is better to start to trek very early in the morning as it is windy at day time. Our guide or porter carries tea or hot water to keep you rehydrate on the way. 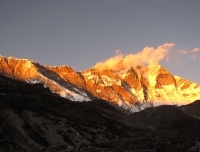 It takes 7-8 hours to get to Thakna from Dzonglha via strenuous Chola Pass/5417m. Stay overnight in lodge. After breakfast, the trail continues gently up and down by crossing Nzojumba glacier until reaching Gokyo which takes about 2 and half hour. Now you have a great view of Cho-Oyu and other peaks. You can see the second lake during the trail before reaching Gokyo. Gokyo Lake is third lake which is also known as Dudh Pokhari; meaning milk pond. You have lunch break and take rest. After lunch walk to fourth or fifth lake with your guide to explore. Stay overnight in lodge. Hike up to Gokyo Peak or Gokyo Ri which is 5560 meter high. About 2 hours climb up; for sun rise view and incredible mountain. The view is far better than Kala Patthar in your trekking. 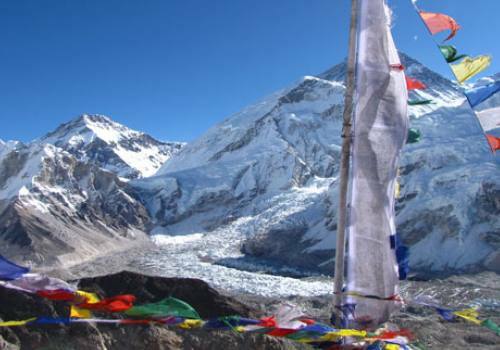 You have an excellent view of four of eight, eight-thousanders including Mt Everest (8848m), Mt. Lhotse (8510m) Mt. 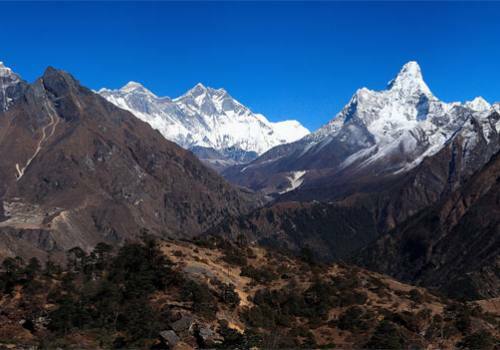 Makalu (8463), Cho Oyu (8153m), Pumori, Amadablam and other peaks. You have also unobstructed view of Sunrise from the top. Come back to hotel and stay there overnight. Day 17:Gokyo – Renjo La (5417m) - Lungden (4350m) 7-8 Hours walk. Day 18:Lunden – Thame (3800m) - Namche Bazaar (3440m) 6-7 Hours walk. We walk down to Thame village which is beautiful Sherpa village. It is an easy walk down to the village and continue to Namche. . It is an easy walk of about four hours takes us to Namche Bazaar from Thame. You can treat yourself with bottle of beer. Yes you deserve it! And hang around in Namche as your trek is about to end after one day. Stay overnight at lodge. Day 19:Namche - Lukla (2800m) 7-8 Hours walk. After breakfast set off to trek to Lukla via Jorsalle, Manjo, Phakding, Ght and Chhplung. Hang around in Lukla Bazzar. There are bars, cyber café, banks, restaurants, curio shops and groceries. Stay overnight in lodge. After hot breakfast at Lukla fly back to Kathmandu at around 8:30am, flight of 35 minutes to Kathmandu from Lukla. One government certified and experienced English speaking local guide. An assistant guide if group size of more than 6 participants in the trek. Daily 3 times meals: breakfast, lunch and dinner during the trek. 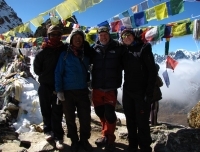 All necessary trekking permits for Everest three high passes trek. Insurance for guide and porters as per state low. All local tax, vat, office service charge and domestic airport taxes etc. Guided city tour in Kathmandu, we can arrange on guest request. Personal travel insurance, internet, phone calls and laundry service. Advance deposit transfer fee to book your trip. A great experience!! Thanks for a Great Trip!! We trekked adventurous and most thrilling ‘Everest Three High Passes Trekking’ of 29 days with Pradip. We found him very professional, friendly and wonderful guide. Pradip’s care and attention for our safety was very remarkable. He took care of us and guided us smoothly to our dream destination Himalaya and safe back to Kathmandu. We have enjoyed a lot in this small beautiful country of mysticism and exoticism, hidden valleys, Crystal Mountains, a deep blend between Buddhism and Hinduism, unique culture and tradition, warm and welcoming people, amazing cultural and natural diversities. Anyone hiring him as a guide can enjoy the trip and feel comfortable with the guide. Overall, we had an amazing and unique experience. I Recommend him as a Nepal’s one of the best guide in Himalaya. Thank you very much for making my trip special, hope to see you again for my next trip. Note: This trip can be personalized as per your requirements that meet your time frame and financial status. The trip price we have offered here is for minimum group size of two travelers. Single supplement cost is USD 250.00, so the cost will be according to Deluxe, Standard, Budget and group size. Please kindly provide us your details for tailor made program. For your information Lukla flight is notorious for being delay problem of domestic flights to and from Kathmandu by few hours or canceled for a day or more rarely, it may happen even in top trekking season also as you know how climate changes effecting our world. So, please allow a couple of spare night/s in Kathmandu following your trek if possible.